Some of my girls favorite videos around the web are short funny stopmotion animation. They can watch those short clips over and over again. 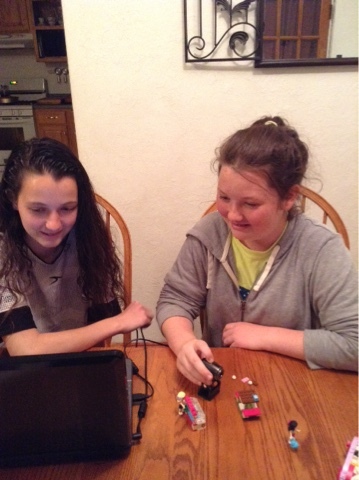 Amber and Delaney were thrilled when I told them we were getting the Stopmotion Explosion Animation Kit from Stopmotion Explosion to review. You might be wondering what stopmotion is. Think back a few years to Gumby. That would be considered a stopmotion animation. It is actually an animation where you move an object in small increments and take a picture of it. When the pictures are played as a sequence the object appears to be moving. The Stopmotion Explosion Animation Kit comes with everything you need to make a stopmotion video. It comes a 720p HD video camera with internal microphone, manual focus, and a clip. The 290+ page Stopmotion Explosion book, and the animation software. The camera is pretty basic. It connects to the computer via the USB port and it has a clip attached to mount it on anything to capture the images. It has a ring around it to focus and a button on the top to capture a picture. The software was very easy to install. I just inserted the CD and followed the on-screen instructions. We received the software CD, but if you do not have a CD drive on your computer you can get the program from a download. We received two books. One is a Quick Start Guide and the other is the Stopmotion Explosion book. The Quick Start Guide helps you get started right away. The main book is very detailed and walks you through the entire process of creating a Stopmotion Animation on a Windows computer or a Mac. It covers every step of the way including adding sound, video editing, frame conversion, and sharing your videos. There is also useful information about using the camera, building a set, choosing characters, creating stories, and the lighting. Information on how films work, the history of film, and using a DSLR in animation is also included. My girls were so excited to get started using this. I downloaded the software the very day we received it in the mail. Amber is 15 and she read through the Quick Start Guide first so they could hurry up and get started. She also read the Stopmotion Explosion book and figured out what needed to be done to finish a film. They spent several days just messing around and capturing images. They laughed and laughed every time they worked with this. They used their dolls, their Lego Friends, markers, just anything that was laying around the room when they were taking pictures. They thought this was more fun than actual learning. Amber learned the most from using this. 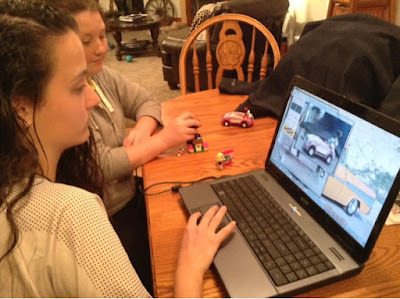 Not only did she learn how to make a stopmotion film, but she also learned how to switch to an external camera and microphone instead of using the built-in one on the laptop. We also had a couple of technical issues probably because we were using an older laptop. She figured out how to troubleshoot those and got everything back on track. We received the Stopmotion Explosion Animation Kit, but if you already own a camera to use you may purchase the book and download the software. There is also a Content Hub that offers Stopmotion education and inspiration through their blog, news, and tutorials. Make sure you stop over and read some other reviews and watch their Stopmotion Animation films.